This evening will start largely dry with clear periods. Later tonight areas of cloud will tend to move in from the east. There will be a light northeasterly breeze. Overnight cloud will tend to clear away. It will then be generally dry with long sunny periods throughout the day. There will be a light northeasterly breeze. A local footballing "legend" was presented with a Guernsey FC shirt to celebrate his 100th birthday. Former GFC captain Sam Cochrane presented the shirt to centenarian Ernie Le Sauvage, who played in the Muratti during the 1950s, after the inter-island tournament's suspension during World War Two. Cochrane said he was proud to present the shirt, and added it was one of his favourite off-field moments for the club. 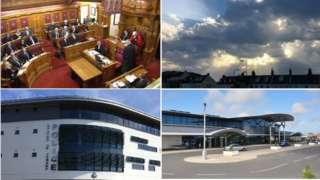 Compulsory purchase powers will be used if negotiations to buy three fields for a new secondary school in Jersey fall through. States members have agreed to allow the government to force through a sale in St Brelade's so that the new Les Quennevais School can be built on fields near the airport. A new offer has been made to the landowner after a planned deal was abandoned. The Education Minister, Senator Tracey Vallois, said compulsory purchase would only be used as a "last resort". Heather Watson will be playing for a place in another Wimbledon quarter-final this afternoon. Watson and partner Henri Kontinen face Ivan Dodig and Latisha Chan for a place in the last eight of the mixed doubles tournament this evening. The pair - who are due to be the fourth match on court three today - won the competition in 2016. Their third round opponents are heavy favourites - Dodig and Chan are third seeds while Watson and Kontinen are 16th. Watson has already made it through to the women's doubles quarter-finals with her partner Tatjana Maria, and will play Katerina Siniakova and Barbora Krejcikova for a place in the semis. The money to bring over the screen and set up the event in Marina Gardens, by Castle Quay, has come from public and private donations. The alcohol-free event is aimed at families and there's room for up to 2,000 people. The cost of transporting, erecting and running the big screen is £9,000 and extra donations have been spent on security, toilets and other related costs. Tickets for the 11-week trial of the service have gone on sale with the first sailing on Friday. The twice daily sailings are being run by Alderney Shipping under the name The Little Ferry Company. Twelve passengers can be carried on each of the hour-long sailings, seats can only be booked online and check in is 15 minutes before departure. Last year 33% of Guernsey's electricity demands was met by energy created by the tidal barrage across La Rance, in Brittany, France. It was part of the energy imported via undersea cables running via Jersey that in 2017 met 86% of Guernsey's electricity needs. The Rance Tidal Power Station, operated by EDF, opened in 1966 as the world’s first tidal power station. Quote Message: The GJ1 cable connects us to the European electricity grid and provides access to a secure source of hydroelectricity and low-carbon energy for the island. The GJ1 cable connects us to the European electricity grid and provides access to a secure source of hydroelectricity and low-carbon energy for the island. The GJ1 cable is also complemented by our solar array installation at the power station in Vale earlier this year, which further demonstrates our commitment to the environment. The firm is investigating installing a second undersea cable running from Guernsey. Named GF1 it would run directly to France. In 2013, a 10-year deal signed with EDF included supplying 30% of the island's electricity from low carbon hydroelectricity. Jersey has one of the fastest broadband speeds in the world, placing it above the United States, Japan and tech-specialist Estonia, according to a new international league table. Islanders are being urged not to light bonfires unless it is absolutely necessary. A Jersey woman is asking for stem cell donors to come forward to help save her childhood sweetheart. Antonio Ferreira needs a transplant to save his life after being diagnosed with Sézary syndrome, an aggressive and rare blood cancer. Doctors say his best chance of survival is to have a stem cell transplant taking cells from a healthy person, with the same tissue type, to replace and repair his own damaged cells. The family is particularly encouraging people from Portugal and the Mediterranean to come forward as there's a shortage of stem cell donors from those backgrounds on the register. Football fans will have plenty of places to watch England’s World Cup semi-final match – and local clubs have spoken of the grassroots benefit of the nation’s success. There have been significant improvements in children's learning and development since free pre-school was introduced in Guernsey, according to the team assessing the impact of the scheme. The first pupils to benefit from it are just completing their first year at primary school, and are being monitored by the States of Guernsey's Early Years Service. Four year olds currently get 15 free hours during term time the year before they start school. Kate Hynes from St Martin's Primary School said children are starting off school in Guernsey more curious and ready to learn and settling in more easily since the scheme was introduced. There were 180 fewer people looking for work in Jersey this year than in the same time in 2017. As of 30 June there were 820 people "actively seeking work" in Jersey, which includes 190 who have been looking for work for more than a year. There were also 280 people classified as "underemployed", so engaged in some form of paid employment but still actively seeking work. Of those "actively seeking work" 88% were receiving income support. This is up from 74% in 2014. Temperatures reached 26.7C at the beginning of this week and are due to remain in the low 20s up to the weekend. Jersey's own psychic tortoise, Corbiere, more commonly known as Corbie, has predicted a win for France against Belgium in the World Cup semi-final. He's had a rocky record since the quarter finals. He wrongly predicted Russia would beat Croatia. He also predicted Brazil would beat France. The supermarket chain Waitrose will not be closing any stores in Guernsey. Rumours circulated that the company may look to close stores locally after the chain announced last month it would be closing stores in the UK. The closures came after a warning from Waitrose owner John Lewis that profits will be "close to zero". States Chief Executive Charlie Parker has defended the extension of his authority over the entire civil service in an official report on his first six months in the job.